DESOTO— In true Eagle fashion the first home game of the DeSoto 2017 Varsity season saw overwhelming support from DeSoto fans as they played host to the Midland Bulldogs. Quarterback Courtney Douglas continued to show his mettle Friday. He ran for three touchdowns to lead DeSoto to a 41-14 victory over Midland at Eagles Stadium. The non-conference matchup began woefully outmatched. By the end of the first half the Eagles had put 21 unanswered points on the board. Sports analysts expected a higher level of play from the 2016 Division I Area Semifinalists. Douglas was 14-22 passing for 131 yards and added 125 rushing yards to finish with 256 total yards. Desoto, (3-0), rushed for 366 yards with Dylan Lawrence leading the team with 168 yards and one touchdown on over 18 yards per carry. Midland, (0-3), was paced by running back Tim Gates’ 90 yards. Midland scored twice in the fourth quarter on passing touchdowns from quarterbacks Sudden Sapien and Riggs McDonald. DeSoto scored on its first two possessions and jumped out to a 14-0 lead with two minutes left in the first quarter. Douglas scored on a 25-yard run early in the first and added a 14-yard run to end the quarter. The Eagles took the field on fire. Immediately drawing first blood on their second drive of the game. Midland attempted to answer with a series of runs that resulted in only 11 yards on 11 plays. A holding penalty finally dashed their hopes of reaching the Eagle red zone and forced a short kick to the 35 yard line. On DeSoto’s following drive, ball handlers sparked glimpses of greatness. On 2nd down after seemingly being taken down by defenders, Quarterback Courtney Douglas saw the light. A quick slant to sophomore wide receiver Lawrence Arnold turned into an “almost” Eagle touchdown. 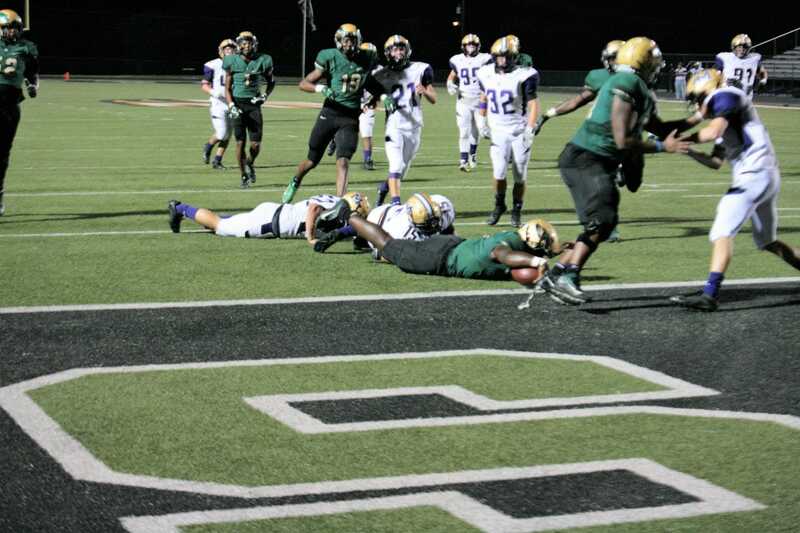 The score was quickly called back after officials cited a DeSoto lineman using an illegal hold. Third down with 26 to go—deep in Midland territory at the 18 yard line Douglas on the option made a 30 yard gain. Scrambling several Bulldog defenders in one movement the Eagles got the first down and were back in action. A quick handoff to the weak side gave wide receiver Jamal Brown all the room he needed to make another 28 yard sprint. Another keeper by Douglas put the Eagles up 21-0 at the half.